The Scottish National Portrait Gallery in Edinburgh has re-opened in its dramatic, neo gothic palace on Queen Street. Ruskin would be delighted. It is a rather rambling interior and quite difficult to navigate. I wondered about with nothing really grabbing my interest, until I stumbled upon, entirely by good fortune, the exhibition of war paintings by Sir John Lavery. Most of them I had not seen before and had never seen them collected together like this. Many of the works were on loan from the Imperial War Museum. 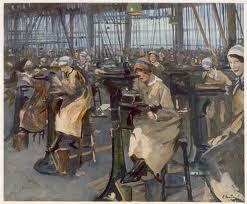 Lavery never actually went to the war. He wanted to. Very much so. He joined the Artists Rifles in 1914 and for a few weeks drilled with them in the quadrangle of Burlington House and went on route marches into the country. But he was 55 by then and was told he would make a better contribution to the war with his paint brush. 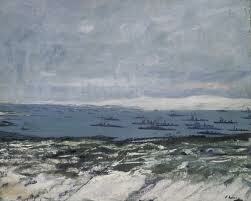 He got appointed as an official war artist and arranged for a van and for transport to the front. But if never happened. His wife became very ill following a motor-car accident and he never travelled to the front. He was ever afterwards bitterly disappointed. He admired greatly the works coming back from the front by other official war artists, in particular those of Orpen, and Eric Kennington, a private in the 13th London Regiment and later Nevinson, a private in the RAMC, and John Nash and his brother Paul, but he constantly remonstrated with himself at not being in at the action. He was asked by the war office to complete a series of canvases depicting the home camps and activities and these works, now on display in Edinburgh are the result. Lavery was unhappy with the works and felt they were a bit thin and not up to the standard of those artists who were in the thick of the action. By this time Lavery was a rich and much sought after portrait artist and had completed portraits of almost every celebrity of his period. He was Irish by birth but the Scott’s love him, far more in fact than the Irish. They claim him as their own largely because he trained in Glasgow and was one of the founders of the Glasgow Boy’s school of Artists. During that period, heavily influenced by the French Impressionists, he had produced works full of colour and light and movement, works that put him alongside the finest impressionists and most certainly the finest British artists then working. He had turned to the riches of portraiture work and although producing some quite outstanding portraits, particularly of Carson and John Maxton the Scottish socialist, he had, by the nature of the work, toned down his palette of colours and his impressionist brush strokes. I think he was wrong to disparage these war pictures. Some of his old colour and light from the Glasgow days reappears. 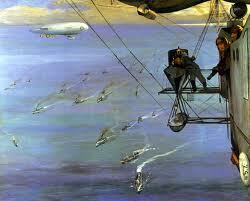 The picture of the air-ship attacking submarines springs particularly to mind. 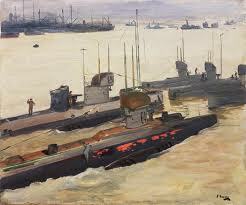 And his painting of the submarines at Harwich is especially fine. He also painted some of the military camps and bases. His painting of the naval air station (for air-ships) at Queensferry must surely capture one of the first ever naval air stations. There is a very good portrait of a convoy sailor, an excellent interior of shell making by women workers in Edinburgh and a haunting landscape of ships lying at Scarpa Flow. 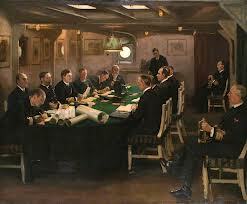 There is also an excellent display of his portraiture skills in the painting on board HMS Elizabeth at the surrender of the German Fleet. Lavery specialised is such pictures, perhaps his most famous example being that of the appeal of Sir Roger Casement against a sentence of death for High Treason. (not in this exhibition but you can read about it here) In both instances he was present at the scene. On board HMS Elizabeth he dressed as a naval officer and hovered in the background behind a pot of flowers. In court he sat in the empty jury box preparing his sketches of the scene. Both are in fact fine war pictures. 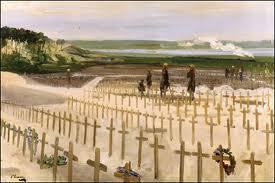 At the end of the war Lavery visited France and captured the rather poignant image of the cemetery being prepared at Etaples with it’s wooden crosses, What a pleasure this exhibition was.